FORT BENNING, Georgia (Nov. 26, 2014) – On November 26, 2014, over four-hundred new paratroopers earned their wings after completing the three week Army Basic Airborne Course and five jumps. 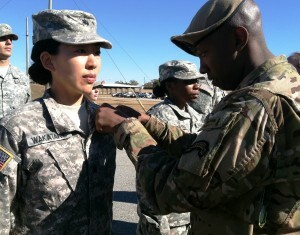 One of the new paratroopers is JAVA Life Member and former editor of the JAVA Advocate, Lieutenant Colonel Kay Wakatake. She is currently assigned as Deputy Staff Judge Advocate for the United States Army Special Operations Command at Fort Bragg, North Carolina. Military lawyers are assigned to all Army units. 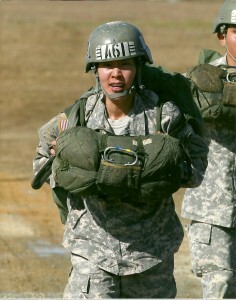 Some units, such as the 82nd Airborne Division, require Soldiers to be Airborne qualified before they can be assigned to the unit. Other units do not require airborne qualification, but when lawyers earn Airborne wings, they demonstrate that they are willing to go through the same training as the Soldiers they support.